Official size and weight, these MacGregor Leather Practice Baseballs are perfect for any machine that uses regular balls or machine balls ( Jugs, Atec, Iron Mike, Heater, Ryan Express and commercial machines). You get 3 DOZEN Leather baseballs, featuring a Compressed cork core and full grain Leather cover. Youth - High School Quality. Most real ball pitching machines require real leather baseballs. Synthetic covered baseballs cannot hold up nearly as well to the stress of a pitching machine, resulting in stripped covers and damaged machines. In addition, you get a 5 gallon bucket with padded lid. 3 Dozen,regulation size & weight MacGregor Leather Practice Baseballs #79P. Perfect for any machine that uses real baseballs( Jugs, Atec, Iron Mike, Heater and commercial machines). 5 Gallon Bucket with snap-on padded seat. 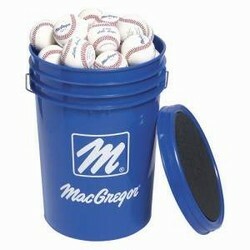 We are using these balls for the a pitching machine.. Very satisfied with there quality.